I had a hard time deciding how to spell the name. 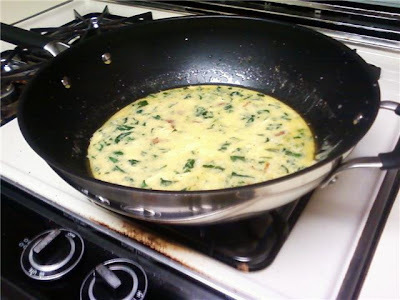 It is essentially an omelet with bacon and spinach. I originally named it the Bomlet because it's a bacon omelet...but now it's call the Bomlet because it absolutely rocks. It is so good. But if I spelled it correctly it would be the Bomelet (which doesn't sound like bomb) or the Bomblet (which makes little sense because there is no "b" in omelet.) What do you think? Yes, we use a wok to make eggs. We're unconventional. Yes, my kitchen is a mess right now. 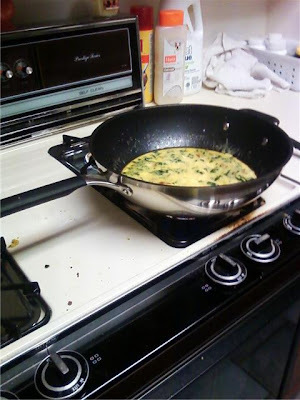 Actually we just make such a big thing of eggs that we didn't have a pan big enough and then I remembered that right after our wedding I bought a wok because I thought I had to have one. My stir fry was a flop and I didn't have any room for the wok so it was retired to the basement. I remembered it this weekend and brought it up to use. I used it to fry the hamburger last night and I used it to make the breakfast Bomlet. First, we fry the bacon. I use my KitchenAid Kitchen Scissors to cut the bacon into smaller pieces. 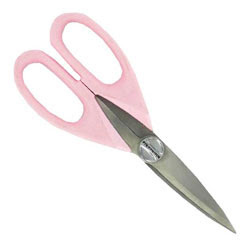 It's way easier than using a knife and then I just drop them into the dishwasher. We buy frozen spinach because it is a much better value than buying fresh because of volume. After the bacon starts to brown we put in some spinach until it looks right. 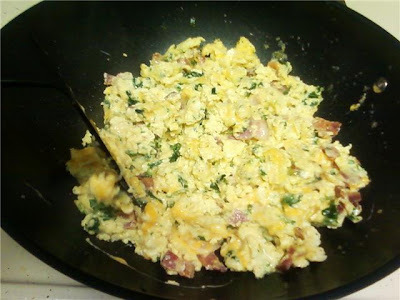 We add eggs mixed with heavy whipping cream and wait for them to cook. If you want to try this, it would be very easy to make lower fat and calories. You could use turkey bacon instead of pork. I would keep the spinach because it is so good for you. You could use whites instead of whole eggs, and you could use skim milk instead of cream, or skip that step entirely. Just saying, it won't taste as good as the Bomlet. Joshua, I'm Posting This For You.